1. David Stern will continue to play the MLB handbook of how to publicly negotiate a CBA. The NBA is thinking about contracting???? Right on schedule David. Soon we'll hear about most of the teams hemorrhaging money... oh wait we already heard that? Yep, David Stern is following Major League Baseball's book of negotiating the CBA in the media. The next six months will be gloom and doom. We'll hear a lot of talk about "despite the success of the Miami Heat" teams are still losing money. They whole contracting thing was Stern's tell. Come on David, you're better than that to play that card so soon. Listen closely... THE NBA IS NOT CONTRACTING!!! This is just CBA psycho-babble. And it was a bunch of billionaries in Major League Baseball complaining that they're losing money that completely turned me off to the sport. It wasn't the steroid era or the '94 strike or Red Sox fans acting like they're cursed when the Cubs are the real cursed franchise. Nope. It was ridiculously rich guys manipulating their finances to negoitiate with the player's union. And if anyone remembers, it was congress that asked for MLB to "open their books" that we realized things weren't all that bad. Stern's playing the same card, saying how the NBA is struggling in it's current form, claiming contraction may be necessary and talking about how there needs to be a hard cap for the league to survive. I guarantee we won't see ticket prices drop the same percentages of this hard cap. Hey, how about a hard cap on ticket prices. Yeah, I thought so. This is just a ploy for the rich to get richer and just like baseball, sadly I may find myself tuning out the NBA. 2. LeBr-ANGER will reign in the media. I'm not talking about the backlash from last summer's The Decision, but the backlash to the backlash. Oh there will be a lot of writers on their high horses around December when the Heat have the best record in the NBA. These are the LeBron James guys who are quietly lurking, waiting patiently to jump out and scream 'I KNEW IT!!!!" These are the same ones who were OUTRAGED!!! that LeBron wasn't a unanimous MVP last season. Remember, Bron had something like 99.9% of the votes yet how dare the few dissenters get in the way of his legacy (or is it LeBregacy). How dare people have an independent thought!!! Well, there's already a slow, steady rumble... just you wait until Christmas Day after the Heat beat LA (who could care less about a regular season game and won't get wrapped in the hype). 3. Phoenix will be better than people think. Amar'e bolted for the bright lights of NYC. (Well bolted wasn't the reality. More like Phoenix low balled him, giving him no option but to head to the Knicks. What a shock, the Suns went on the cheap.) Gone is their athletic superstar, true highlight reel, their best rebounder, best lowpost scorer, annual All-Star and "we're a contender with this guy" guy. In comes Hedu Tukoglu, exiled from Toronto for good reason... he stunk and Hakim Warrick. On paper a true 50 cents on the dollar deal. But I like the gamble. Instead of finding a big for a big they went long and fast. Meaning, they grabbed two guys that will fit in Alvin Gentry's SSOL offense. The Suns found their rhythm last year because they were loaded with guys who could hit the deep J's and spread the floor for both Nash and Dragic to work their magic. Turkoglu was always able to shot from beyond the arc and he brings another clutch player for the Suns down the stretch (remember, he was THE Magic's go to guy during their title run in 2009). Yes, Turkoglu doesn't play any defense, but let's be honest here neither did Amar'e. The Suns know exactly what kind of team they are in a speed, great perimeter shooting and just enough D. The X-factor is Steve Nash's leadership and I expect a 2009 Turkoglu instead of the Toronto version. I'm not saying the Suns are a repeat Western Conference Finalist but I expect a top 6 finish. 4. Utah Jazz are a legit threat to the Lakers. First off, I was completely wrong in thinking the Al Jefferson deal didn't improve the Jazz. I'm still a little weary an injury-prone player who never seemed to carry his team to the playoffs. But I saw Jefferson play the Lakers last week and they guy is seriously locked in. I know it was preseason, but he gave Pau Gasol fits on both ends of the floor. He controlled the glass and scored anytime he posted up. Utah just might be able to hang with LA's size. But the real reason why Utah is a legit threat to LA is the sneaky-good Raja Bell signing. Lakers fans never really felt threatened by the Jazz the past three seasons because they never had a player who could hang with Kobe. When all else failed, Kobe could bail out the Lakers with a dominant 40 point game. AK-47 might hang with Kobe a quarter or two but eventually Bryant would break, leaving Kirlienko walking away with slumped shoulders and shaking his head. Despite his age and being maybe a slight step slower, Raja Bell has physical skills and more importantly mental make-up to hang with Kobe. Great baseball closers never let the last pitch get under their skin. A blown save is easily forgotten the next day. Bell (like Bruce Bowen) approaches defending Kobe the exact same way. Kobe might be in one of those zones where every deep three is falling and Staples Center is going crazy, yet there's Bell in Kobe's face with the same lock-down intensity regardless of the score. Combined with Kirlienko, the Jazz can work and older Kobe all game defensively. I expect a few off nights against Utah this season. Mix one of the top coaches in NBA history, a top 3 point guard and still one of the best home courts and the Lakers have a serious challenge with the Utah Jazz. 5. LeBron will win the MVP. Kevin Durant will be the early favorite and for good reason. What he did last summer with Team USA, carrying them on his back and winning the World Champioship, was beyond impressive (and sad that few will remember the feat because most Americans can give a crap about the FIBA championships). I'm looking forward to watching Durant grow as a player the next few years. HOWEVER, I feel as this season continues people will appreciate what LeBron does with the Heat. It's not easy to create a team out of thin air, no matter how talented, and lead them to 60-plus wins. And make no mistake (football cliche), the Heat are LeBron's team and he'll earn that MVP. 6. Lakers will threepeat. Yeah, big shock, a Lakers fan goes with his team to with the title. Hear me out... Miami will match and probably exceed the hype. But it's hard to create a championship out of nothing. The playoffs are all about talent, heart and soul (which Miami has) but it's also about experience as a team and the belief in one another. The Heat haven't been down that road yet. How will they respond to a series deficit or the slow/grind-out style of a team like the Celtics (LeBron's Pistons though we're no longer allowed to compare him to Jordan). 2010-11 isn't the Heat's year... but 2011 thru 2014 will be a different story. I don't think Miami gets past the Boston Celtics. The Celtics basically traded Rasheed Wallace for the O'Neal brothers. The Celtics have a ton of depth up front to close off the lanes against Miami and control the pace. Plus, after last season, Doc Rivers has entered in the exclusive coach-for-the-entire-season rather than game-to-game group with Phil Jackson and Gregg Popovich (seriously, after last season I really believe Doc is a top 5 coach. The NBA is all about massaging egos and those three are THE experts at it.) The Celtics are built for two things, to beat the Miami Heat and Los Angeles Lakers. Rondo will only get better and The Big Three have just enough in the tank for one or two more runs at a title. I can't wait to see how this Celtics squad plays out and will keep a close eye on them from out here in LA. Plus, let's be honest, Shaq riding off in the sunset in the Finals against LA would be, dare I say... fan-Shaq-stic! Lakers will beat Boston in 7 games to win the 2010-11 title and give Phil Jackson a four threepeat. Get NBA predictions from our experts and beat the NBA spreads this year. Nice of the Lakers to "grant" us an exciting Game 1 by completely scrapping a successful offensive game plan most of the second half (ummm I believe they call it the Triangle) to barely beat Utah 104-99. That game should NOT have been this close. Let's be honest here the Lakers are a terrible match-up for the Jazz. LA's length in the front court causes problems for the smallish Boozer and Ronnie Millsap. 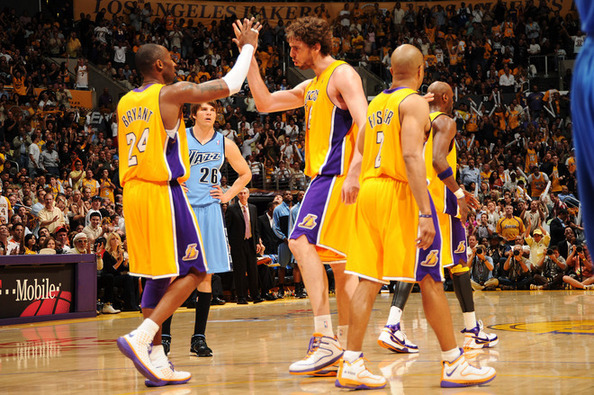 Utah's thorn in the Lakers side was Okur forcing Bynum or Gasol to step out and defend the three. Well Okur's gone and his replacement Fesenko is big but slow and nailed to the paint, allowing Bynum and Gasol to clog the lanes a keep Boozer from attacking the offensive glass. Oh and did I mention the Jazz don't have anyone to defend Kobe? Forget Kirilenko's injury, when healthy he wasn't able to stop Kobe. The Jazz have never had anyone to stop Kobe. Really Deron Williams is Utah's only advantage (well that and the Lakers boredom) and he's not dropping 40 points and 20 dimes anytime soon. This is just a bad match-up for the Jazz. But they are well-coached, disciplined and talented enough to make this a 6 game series. What happened to the Triangle in the 2nd half? 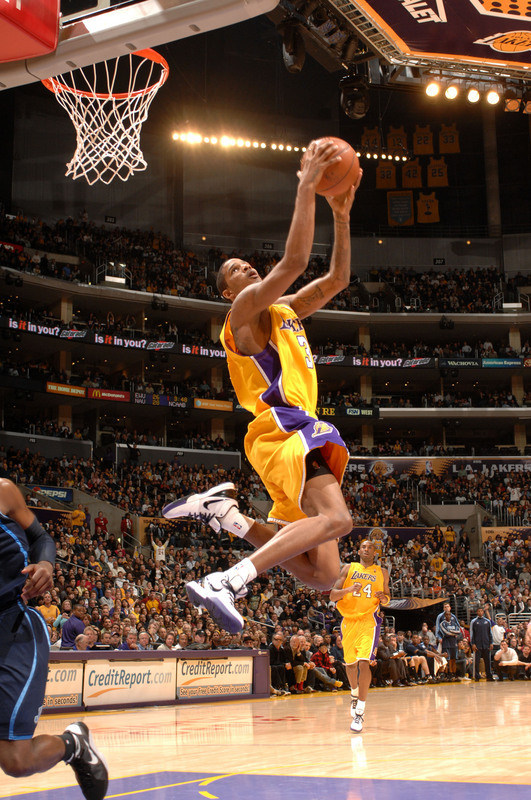 Did you see the backdoor cuts from Artest and Odom in the first half? Yes. Did you see all the easy baskets after the ball was worked around the perimeter? Yes. Did you see the Lakers pounding the ball, dribbling around in the first half? No. That's what we in the business refer to as the Triangle Offense. For a second I actually believed that Ron Artest finally got the offense. Watching him slash down the lane and get the feed off Gasol was a thing of beauty. This is why NBA higher-ups always thought Gasol was the perfect fit for the Lakers. His court vision, patience and intelligence fit perfectly in the Triangle. Did you see the no-look behind-the-back bounce pass to Bynum for a dunk? (BTW - it's didn't count because of a foul but it got a loud "Ohhhhh!!!" from the 300-level) The Lakers spread the floor and initiated the offense from inside out.. in ONLY the first half. And for much of the first half the Lakers actually looked the part of defending champs. Ahh but then the 2nd half rolled in... Dribble, dribble, dribble, fade-away... dribble, dribble, dribble, fade-away. Part of it was the Jazz bigs forcing Gasol and Bynum out of the low post (more on that later) but a huge part was the Lakers guards simply not initiating the offense from the inside. As Phil Jackson would say, the team lost their direction in the 3rd quarter. And it spilled over onto the defensive end as the Lakers couldn't get a stop. What's so frustrating with the 2010 Lakers is how quickly they revert to bad habits with too much dribbling and too many threes. It's obvious they know how to win, but like a rebellious teenager they refuse and want to do it their way. And only when their backs are up against a wall, like say 5 minutes left with the Jazz leading, do the Lakers finally collect themselves and do it the right way. Good Kobe saved bad Kobe. Kobe took over down the stretch getting clutch jumpers from his sweet spots near the freethrow line and just out at the short 17. But it was bad Kobe that maybe forced good Kobe to save the day. Late in the 2nd quarter he got into a little one-on-one tussle with CJ Miles and let the refs get to him. Kobe bristled that Miles was aloud to body him around and lost his focus. Predictibly he tried to respond and took the game right at Miles, trying to force the refs to call something. They did... *TWEET*...Offensive foul. A comfortable double digit lead went bye-bye as the Jazz took some momentum into the half with Kobe now in foul trouble. Do we need to start MVP chants for Gasol? Phil Jackson thinks so...25 points, 12 rebounds and a playoff career-high 5 blocks... and he made ALL of his freethrows!!! If this were fútbol "they" would say Gasol is in good form. His game is peaking at the right time, especially with several Lakers injured or temporarily disappeared (that's you Odom!!). Boozer isn't going to be attacking the offensive glass in this series. Gasol's defense is forcing Boozer to work very hard for his points, forcing him into fade-aways that take his monentum from the offensive glass. Utah's bigs turned the game around on defense. It started slowly in the second quarter but the Jazz's bigs bodied Gasol, Bynum and Odom out of the lane, keeping the from posting down low. Slowly over time the Lakers bigs got discouraged from all the physical play. Suddenly Gasol's getting the ball 12 feet from the basket and forcing shots.... SHORT! Plus when the Lakers did get the ball low, the Jazz doubled off Artest (and why not after all he is the WORST three point shooter in the playoffs), frustating the Lakers bigs into contested shots and turnovers. Utah's defensive approach was patient very much like an NFL team that sticks with the run. As time passed (and possibly with the benefit of the short turn-around) the Lakers bigs just didn't seem interested in fighting to get low. I expect more of this in game 2. Ron Artest... just one thing here... STOP SHOOTING THREES!!!! Seriously, the way he worked in the offense in the first half I thought, "Hey' he's finally getting this!!!" But late in the 4th quarter, with the Jazz defense daring him to shoot the three (umm because he's like 1-918 this postseason)... there he goes again, firing one up from downtown... and like downtown LA on a weekend... no life. STOP SHOOTING THREES!!!! Quick question, who is the longest-tenured coach in any major professional sports in the United States? Who has coached through three different eras in the NBA, each with three entirely different types of players yet continues to earn their respect? Who took a small-market franchise to 19 playoff appearances in 22 years? Who is the only coach in NBA history to record 1,000 wins with the same club? And who still has not received a Coach of the Year Award? It's time. Give Jerry Sloan the 2009-10 Coach of the Year Award. Now I'm never one to fall for the career achievement award in the guise of an annual award. If it was, then just call it a career achievement award. No, that's not me. Jerry Sloan actually deserves the award this year... but it doesn't hurt that he has a hell of a career resume to back it up. Isn't it time we look a little macroscopically when giving the COY? It's not just overall records, but also how the coach relates to his players. It's not just leading a team you NEVER expected to win, but it's leading a team though the dog days of a long regular season. It's not just wins and losses, but the ability to delegate and adjust as the season rolls along. Sloan got the Jazz to rally and play typical Jazz ball: balls-out effort, hard-nosed defense and balanced scoring from all five positions. Players got healthy, roles became defined and the Jazz continued to move up the standings. They're 27-8 since January 9th and currently sit 4th in the West, but only 1 game out of the 2 seed (more importantly avoiding the Lakers until the Conference Finals). Isn't this what we ask from our coach of the year? I know we're still many weeks from awards talk, I just want people to finally recognize a coach who shockingly hasn't been recognized. Ariza's Message is Clear: Play Me Down the Stretch!!!! Kobe always kills Utah. Kobe had one of his better offensive nights of the year on his way to 40 points. But doesn't it always seem like he kills Utah? Two seasons ago he had 30 points in the 3rd quarter on his way to 52 and last spring he was able to score at will. Is he jealous of Kirilenko's deal with his wife? Is he a Mormon hater? All I know is that Utah's defensive scheme allows Kobe to roam free inside the freethrow line for an open J or a quick pass to any backdoor cutters.... which totally makes sense against the defending MVP. Utah just might want to mix in a double-team on Kobe every now and then. Deron Williams almost single handedly rallied Utah. This game had shades of the 2008 Playoffs where Williams played possum in the first half and laid low from the perimeter only to ferociously attack the rim in the second half. Williams continued to drive and break down the Lakers interior defense the entire second half creating open jumpers for everyone and cutting a 20 point deficit all the way down to 3 several times. So why wait so long to take over? CLEARLY he can take Fisher to the rack any time so why not break down the Lakers defense early on so Utah's not trailing 37-20 after one quarter? Lakers look more November than December. They're not playing with the same intensity as they did early in the season where every game seemed like a 30 point blowout, but the Lakers are learning how to play with more focus and effort. They aren't disappearing for long stretches like they did a few weeks ago. On the surface it looks like that team meeting really worked but beneath the surface the key has been Phil Jackson shaking up the lineup and playing Kobe when it appears that the bench is struggling offensively. Also Ariza and Vujacic, the Lakers most active defenders, are playing more minutes especially now with Farmar out. The Gasol Rebound: I was at the game and from my seat it completely looked like he pushed off. Call it a push off, call it a flop... I call it a case of the Jazz getting a taste of their own medicine. Carlos Boozer literally pushes off for every single rebound daring the refs to foul him out along the way. So OF COURSE he's getting away it. Deal with it Utah! Kobe's Still Injured: A friend of mine felt that Kobe was playing possum on the back injury ready to explode last night. Well, he tried to send a message of "I'm Back!" with a few early hoops, but he's obviously still hurting as he wasn't dominating offensively. With the game very tight down the stretch, I kept waiting for Kobe to take over and carry the Lakers. He just didn't have any explosiveness after halftime and was looking to facilitate the rest of the game. The injury also affected his ability in the open court as he committed a ton of terrible turnovers. The Jazz were clogging the lane on fastbreaks, daring him to drive. Kobe wasn't explosive enough to split the D and ended up throwing away too many passes. The Lakers NEED a healthy Kobe to win on Friday. Radmanovic, welcome to the playoffs! Radmanovic decided to join the Lakers in the playoffs for a change with 15 points (BTW - he scored a COMBINED 12 points in Games 2,3 and 4). There's a reason why Phil Jackson calls him a space cadet. The guy has been completely and thoroughly worthless this postseason, but it's not like Luke Walton's done any better against the Jazz (a COMBINED 27 in six games against the Jazz). The Lakers are going 4 on 5 in this series as these guys are terribly choking. And it's not like they’re making up for the offensive deficiencies by hustling on defense either. Trevor Ariza where are you? Smush Farmar: It's hard to believe that a bunch of UCLA homers were begging for him to replace Fisher in the starting lineup back in March. He had a few clutch plays last night, but his confidence against the Jazz is completely shot. Where are those balls out drives? Where's the three point range? Where are the key steals at halfcourt? Where's the confidence? The Steve Javie Effect: I seriously thought the Lakers were screwed when I saw that Steve Javie was reffing tonight. All of the NBA refs are influenced by home crowds except for Javie. The guy loves getting booed. Anyone thinking that the Lakers got all the calls last night are thoroughly and completely wrong. The refs favored Utah for the first 2 1/2 quarters (Kirilenko elbowing Odom AND getting the call, Deron Williams getting touch fouls in the 2nd quarter, Boozer running over Gasol in the post AND drawing a tripping call from Gasol) and they balanced it out down the stretch. Utah is playing with confidence: If this was a nine-game series, I'd give it to Utah in 8. They are definitely playing with a level of confidence that didn't exist in Games 1 and 2. Maybe it's a case of Kobe being injured. Maybe it's a case of Deron Williams finding his groove (ever since the 3rd quarter of Game 2). Maybe it's the Lakers bench choking. Or maybe it's the momentum from two HUGE wins at home. Either way, the Jazz have the momentum on their side as this series moves along and they have a great chance at winning a Game 7 on Monday. 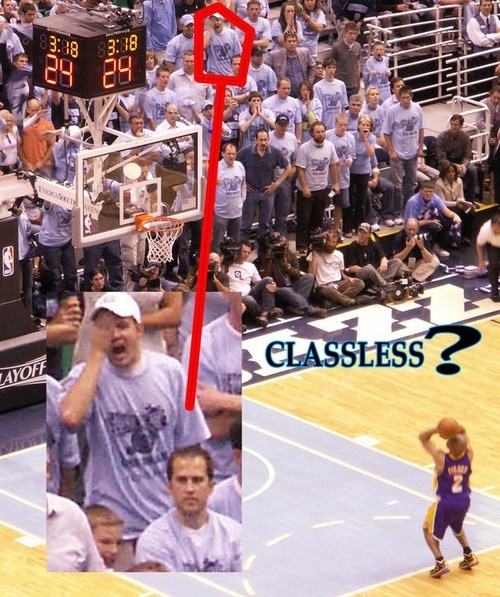 Excellent post at the Bleacher Report discussing classless Jazz fans, along with this photographic evidence.